At Da's request I am detailing how to carmelize sugar. Step one: Put 1 cup sugar in heavy saucepan (I use a non-stick pan). Step two: Turn heat up to just slightly above medium. Step three: stir frequently but not constanly, scraping sides with a heat proof spatula. Clumping will occur, but it will eventually all melt. Take off the burner when it turns a light amber color. Yep, that's it. I was previously scared of doing this, but I've done it several times now, and it always works. 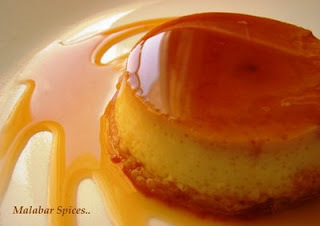 After you use the caramel, just put the pan in the sink with some water to let it soak, and that will dissolve the sugar after several minutes. I have read several times that you should not stir the sugar, and only brush the sides of the pan with a pastry brush dipped in a little water, but that has not worked for me. The idea is that the sugar will crystallize if you stir it. I haven't had that problem.